love this shirt. that is all. 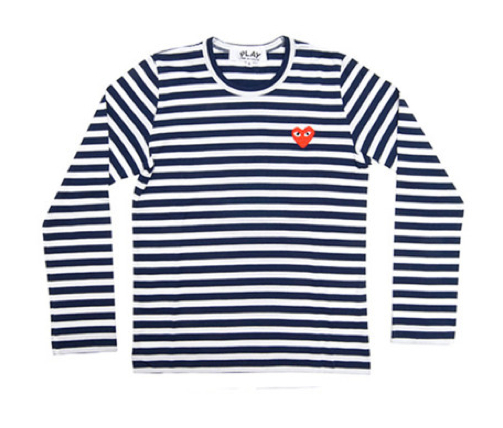 I've seen those comme des garcon play shirts every where! That little heart is so recognizable. You certainly can't go wrong with a classic striped top, I don't think you can ever have enough! Perfect, perfect, perfect. I love SR. She makes the basics fun. omg! too cute. a Play X breton stripes collab was inevitable. This is one of those things I wouldn't mind wearing if someone gave it to me, but left on my own I probably wouldn't fork out the money for it, so you;re right in that it's the perfect gift idea, hahaha. Love these! have you seen the new spotty ones? They're adorable! Oh I've got this but with a green heart -- one of my favorites I take it with me on every trip and constantly worry it will get a hole near my belly button (which almost always happens, what's up with that?). I got it years ago on Yoox for about $30. Crazy no?